We had out first UCOA meeting of 2013 this evening at Texas Mist out in south east Austin near the airport. I always try to arrive early so I usually take the most direct route from my house in north Austin, which would be to take 183 out, but since TxDOT has that all torn up, I took the scenic route out 973. I left over an hour early, but though it was a long haul, I didn’t have to sit in traffic anywhere for more than a couple of minutes. I arrived in plenty of time for some socializing, and that is an important part of the experience. We had lots of people at the meeting itself, almost everyone was in attendance.. Bam Bam our fearless chairman, kept the meeting to the point, and so it only lasted about 1/2 hour. Then it was time for more socializing and a final few pictures before heading home. All in all a good evening. 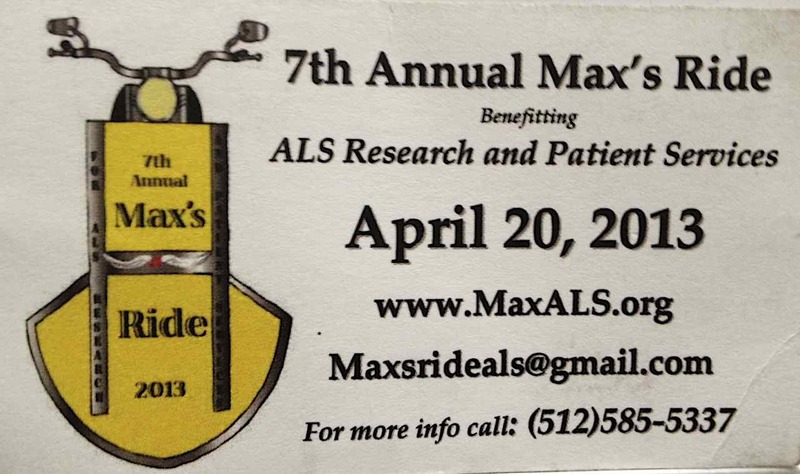 First up is a scan of the event card for the 7th Annual Mix’s Ride, which is a benefit that raises money for battling ALS, a disease that has effected a disproportional number of returning military veterans.